Huge waves are expected off the Cornish coast and a surfing competition has been called at short notice at Newquay to take advantage of them. The Goldrush big wave event is backed by the British Surfing Association. Waves up to 9ft (2.74m) high have been forecast and surfers will be hoping to get the perfect conditions for a classic barrel on Fistral Beach. 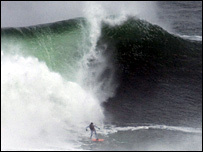 Organiser Tristan Perry said: "Low pressure over the Atlantic gives you a good swell." Last year spectators saw some of the UK's best surfing with waves created in the tail of Hurricane Gordon. The annual event is called at three days notice and some of the best surfers are invited to take part. This year 16 British surfers including Ben Baird, Sam Lamiroy, and Ben Skinner will be in the water fighting for the £1,000 prize money. Mr Perry said: "Five days ago we could see conditions were promising." "It's not quite as big as last year but it's extremely good for any contest." Tristan Perry is one of the BSA judges and rates this competition highly because it is set around the wave potential, not the weather conditions. "As the tide goes out the waves are getting bigger and bigger and finally this afternoon for the final it should be near perfect." Dave Foster, one of the event co-ordinators said they could see a repeat of the perfect 10 score achieved last year, a mark given to Jersey surfer Scott Eastwood who rode his wave perfectly in the last minute of the competition.